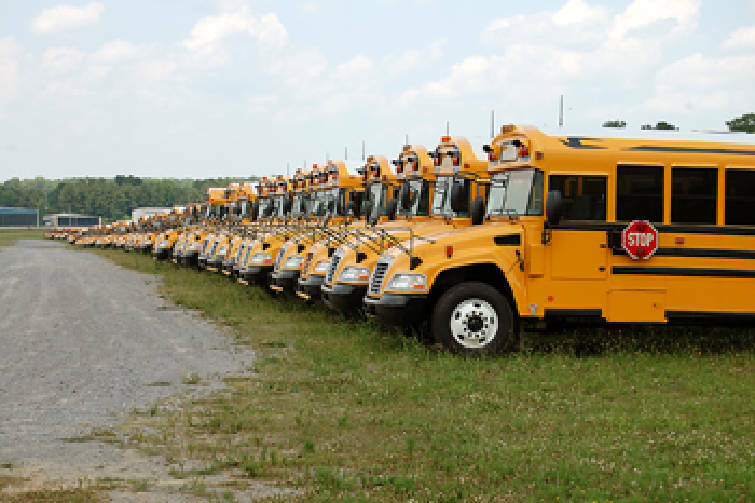 Staff Photo by Andy Johns/Chattanooga Times Free Press - Finished school busses sit in front of Blue Bird in LaFayette. The company announced Thursday it would close the plant in August. LAFAYETTE, Ga. -- As workers at the Blue Bird plant in LaFayette figure out what to do next, some say they were caught off guard by Thursday's announcement that the plant would close in August. "The whole plant was just hit in the back of the head," said Michael Camp, who has worked on one of the lines at the bus-making plant for five years. "Everybody over there was blindsided. It was awful." Over the last four months, he said, workers from the Fort Valley, Ga., plant, located about 30 miles southeast of Macon, had been coming up to LaFayette, reportedly training to improve the quality of the Central Georgia plant. On Thursday, the company announced it was closing the Walker County plant Aug. 30 and moving the jobs to Fort Valley. "It's like stabbing you in the gut," said Mr. Camp, who lives about a four-minute drive from the plant. Others said they saw it coming. John Bell, of Chickamauga, Ga., said he read the signs before the layoff was announced. 1927: Albert Luce builds Blue Bird No. 1, one of the first school buses to use steel construction. 1935: First dedicated school bus plant opens in Fort Valley, Ga., as Blue Bird Body Co.
1945: Original plant is destroyed by fire; present headquarters opens in 1946. 195o: Albert L. Luce Jr. takes over as CEO; other brothers, George and Joseph, join the company. 1958-75: Blue Bird opens plants in Brantford, Ontario; Mount Pleasant, Iowa; Guatemala City, Guatemala; Buena Vista, Va.; St. Lin, Quebec. 1992: Blue Bird purchased by Merrill Lynch Capital Partners. 1999: Blue Bird purchased by Henley's Group, United Kingdom. 2004: Company becomes property of Peach County Holdings. 2006: Company purchased by Traxis Group, B.V., headquartered in New Haven, Conn.
"This is the second time I've been through this with Blue Bird," said Mr. Bell, 54, who works mounting bus bodies on chassis. He started with the bus maker the first time it opened a LaFayette plant in 1982. That lasted a year, he said, then everyone was laid off and the plant shut down. Rehired when the plant reopened in 1988, Mr. Bell said he's been there ever since. He said the first sign of impending change this time was when the plant manager's office was transferred back to Fort Valley about six months ago. Last Thursday the company laid off about 53 temporary workers in LaFayette, he said, and production slowed from 23 buses a week to 18. "Blue Bird's new year starts in October, so we figured we could ride it out until then, but that didn't happen," Mr. Bell said. Workers were told they'd get four weeks' severance pay if they stayed until Aug. 30, he said. "I don't know what we're going to do now," he said. "I've built school buses for 22 years -- what am I going to do?" Mr. Camp was also unsure as to what comes next. He said he'll probably look for construction work, which is what he was doing before he came to Blue Bird. "There's a bunch of them that's going to hit up Volkswagen and all that," he said. Robert Fincher, who lives a few hundred yards from the plant, said he knows of at least one worker who went straight to appliance manufacturer Roper -- which shares the industrial park with Blue Bird -- to apply for a job after the closing was announced about 4:30 p.m. Thursday. "I'm sure a lot of them have already started looking," he said. His son-in-law and five or six of his friends from church work at the bus plant, he said, and there are some families he knows of where the husband and wife both work at Blue Bird. "It's sad," he said. "It's a very sad day."